Scientists around the globe have noticed that over the last 40 years Earth, as a whole, has been warming. This phenomenon, known as global warming, is affecting regional climates differently. For example, some regions may experience warmer summers, while other regions may see winters with heavier snowstorms. A rise in Earth’s average temperature isn’t always immediately apparent. For example, some places still get snowy winters which might appear to contradict the idea of global warming. (Check out Andy Warner’s comic to learn how global warming can actually lead to heavier snowfall). So, how do scientists know Earth is warming? Scientists don’t just look at one set of data; in fact, they analyze a whole body of evidence. One of the clearest indicators of a warming world is change in the Arctic. There, slight increases in temperatures can be the difference between ice and liquid water. Increasing temperatures are leading to declines in glaciers and sea ice. Other indicators of a warming world include rising sea levels and increases in ocean heat. Click on the text boxes above to learn more about the evidence that supports global warming. How do rising sea levels indicate a warming world? How do shrinking glaciers and declines in sea ice indicate a warming world? How does an increase in ocean heat content indicate a warming world? What does the temperature data graph in this interactive show? 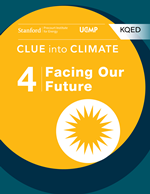 This interactive explainer is part of our Clue into Climate collection of resources. 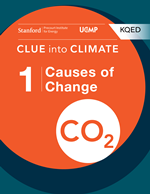 This interactive explainer is featured in our Clue into Climate e-book series. Click on the tabs below to download our free e-books and subscribe to our iTunes U course. You can also visit our e-books page to view our other offerings. Look into the causes of climate change, and discover how scientists develop and use climate models. Learn about how climate change influences precipitation patterns and how it impacts our frozen landscape. 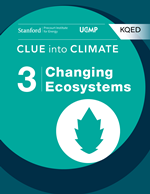 Investigate shifts in the distribution of plant and animal species due to climate change, and the effects of increased carbon dioxide emissions on the ocean. See how communities are preparing for sea level rise and other impacts of climate change, and ways we can help minimize future climate change. I would have thought, at first glance, “Cooling Stratosphere” and “Rising CO2 Level” would be principal among the categories of evidence. Rising surface temperature is often dismissed by one wag or another with various made-up causes that might also fit, but where the surface temperature rises while the stratosphere cools? That is like a fingerprint, identifying rising CO2 levels in the biosphere as the culprit. And of course, rising CO2 levels in air, water and soil must be considered key to this puzzle. Its source in fossil fuels dug up or drilled or fracked has to be discussed. That this rise is the result of unrestricted dumping of fossil wastes has to be considered the issue — the only issue — in this discussion. Under “Rising Temperature” it would be important to discuss the shape of the temperature rise over the surface. This rise is more intense toward the poles, due ‘polar amplification’, as it is easier to warm very cold regions than slightly warmer ones. The rise is more intense in summer than in winter, as there is more sunlight in summer and Green House Gases (GHGs) like CO2, the waste product of burning, only create the Green House Effect (GHE) while Infrared (IR) light is re-radiating from the surface where sunlight warmed the materials there. Summer and winter happen in opposite months in the Northern and Southern Hemispheres. The Northern Hemisphere, having more land area by far, has by far the more intense warming in summer. This warming follows the predictions of the dozens of global simulation models with eerie accuracy, indicating that the models do not properly capture the Great Conveyor in the southern oceans, the main vector carrying surface temperature heat to mid-depth ocean heat content. Consequences of Rising Temperature are important too, from thermal expansion of glaciers and waters, to shifting habitats for plants and animals (more lines of evidence), to changes in growing seasons mismatched with changes in animal hibernation and feeding, to the weakening of the Jet Streams around the poles resulting in more extreme weather, more durable ridges holding storm patterns and dry patterns over areas longer, causing more frequent floods, droughts, blizzards and superstorms, all of which have been observed and are evidence. The period doubling of cyclones is an outcome of increasing temperatures. We know the frequency of landfalls of Medicanes — Mediterranean hurricanes — has doubled about every fifteen years since global warming began. The slightly larger Indian Ocean basin has seen a period doubling of about every seventeen years. The larger the climate basin, the longer the period, it seems. This period doubling is a prediction of Chaos Theory, and strong mathematical evidence of external forcing in a complex system. It is like a DNA pattern pointing at fossil waste CO2 as the culprit. There is no empirical evidence that CO2 is a significant cause of atmospheric global warming. Catastrophic global warming caused by CO2 emissions is based on an unproven theory and computers which overemphasize CO2’s role in climate change and de-emphasize the role of clouds, solar cycles, ocean cycles and other natural causes of climate change. These computers have been notoriously wrong almost all of the time (when compared to real world data) and have been compared to a sports team that played the entire season without winning a game. Computers that model an imaginary planet and are programmed with guesses of a few of the many variables affecting climate are not data or empirical evidnce. During the last ice age CO2 levels fell to 180 ppm and plants started to shut down. If CO2 levels had reached 150 ppm or lower, plants would have died off and all plant and animal life on the planet would have died. We currently have global CO2 levels at just under 400 ppm. Green houses regularly keep CO2 concentrations at 1000-1200 ppm because the plants grow better. In the past, CO2 levels have been at several thousand parts per million and plants and animals thrived. US submarines try to keep CO2 levels below 8,000 ppm. Federal OSHA standards set CO2 maximums at 5,000 ppm. We are much closer to being CO2 deprived than we are being threatened by too much atmospheric CO2. Plants thrive on more CO2- that is a good thing. CO2 is not a pollutant. It is a colorless and odorless gas that comprises only .04% of the atmosphere. The most predominant greenhouse gas is water vapor. The world has not experienced atmospheric global warming in the past 18 years despite increasing CO2 emissions during this period. If CO2 was a direct and significant cause of global warming, we would have experienced global warming during the 18 year pause. We did not. Climate change is natural and has been occurring since the formation of the planet. The 18 year pause just proves that the skeptics were right all along-natural causes of climate change are more powerful than the insubstantial effects that human generated CO2 has on the world’s climate. The hysterics’ alarms over CO2 causing catastrophic global warming have been described accurately as the flea wagging the dog. Proof positive that CAGW is about power, politics and greed is the fact that every time the facts change, the CAGW cult moves the goal posts . They have at least 65 excuses for the more than 18 year pause in global warming and the failure of the CAGW climate models. The CAGW cult blames any unusual (but normal) climate event on global warming with no scientific proof. This is often done with a scary picture or one that pulls on the heart strings, and the text of the article will say “could be caused”, “is consistent with”, or “may be caused by” global warming. This is code for we have no scientific evidence but we want to scare you so we can tax CO2 and promote our political agenda. The real Deniers are the CAGW believers who deny the scientific studies showing that CO2’s role in global warming is not substantial and that nature (clouds, solar cycles, ocean cycles, and other natural causes) controls climate change. The CAGW believers deny nature. Ironic isn’t it that so many who worship Gaia deny nature? Unoriginal, and false. Debunked so many times it qualifies as a candidate for lie of the year. Word for word, the same spammy comment as in http://ecowatch.com/2014/10/13/pentagon-war-climate-change/ from two months ago. And that makes it, what, the thousandth time for this particular cut & paste trollery? What does it tell us about the mind of someone who volunteers to troll in favour of fossil waste pollution? Instead of attempts at insults, why not provide the empirical evidence the proves that CO2 emissions are a significant cause of the global warming that the world experienced 18+ years ago. Out of the thousands of studies that you claim exist there should be several that prove the underlying hypothesis. I keep asking for the empirical evidence, but no one (including you) can provide it. And my posting history is not private. Anyone is welcome to review it. “Reading breathless media reports about CO2 “pollution” and about minimising our “carbon footprints”, one might think that the earth cannot have too little CO2. Humans and most other animals would do fine in a world with no atmospheric CO2 – but most plants stop growing if CO2 levels drop much below 150 ppm, so we would starve to death without at least this minimal amount. We are probably better off with our current 390 ppm than with the preindustrial 270 ppm, and we would be better off with still more CO2. For example, there is evidence that California orange groves are about 30 percent more productive today than they were 150 years ago because of the increase of atmospheric CO2.”. Only politicians, bureaucrats, and true CAGW believers think CO2 is a pollutant. Why do you waste your time promoting the CAGW myth or are you paid by the green blob? Insults? Not by a long shot. Empirical evidence? Asked and answered, repeatedly. We’ve gone through this goalpost moving exercise of yours before, and countless times. You get presented empirical evidence as you demand. You then both argue that it doesn’t meet the definition of empirical evidence as long as you can get away with that ploy and then start arguing that it’s evidence that doesn’t satisfy you. In the end, we discover what you really mean is you’ll never change your mind, no matter what evidence is shown you, and you’ll carry on repeating the same tricks so long as there is discussion anywhere about it that doesn’t bar you. You broke your link in cut & paste. It’s http://www.livescience.com/21456-empirical-evidence-a-definition.html – Kim Ann Zimmerman’s dumbed-down description of the beast. It’s an okay article, from someone with a BA in Journalism who has never done any work in science, at all.. if you don’t mind oversimplification without authority or support of cases, examples or rationale. I’m sure she’s a very nice person, and almost everything she writes is accurate enough, and well-supported by sources she doesn’t cite and rationales she doesn’t explain. In the past, you’ve used the first line of Kim Ann’s little piece to slam GCMs, contending that they are not observation (though they depend on observation) nor experiment (though they are most certainly used in experiments). When reminded that less than two percent of the climatology case for AGW relies on GCMs, though it is consilient with their results, you’ve moved the goalposts before fleeing the scene. Over, and over, and over again. Where is the empirical evidence proving that CO2 emissions are a significant cause of the global warming the world experienced 18+ years ago? If you want a controlled experiment, you will need to find another Earth. There isn’t one; there is no planet B.
cut ‘n paste the same nonsense. Over the last half century, 250,000+++scientists around the world have studied, experimented, reexamined and reevaluated the growing MOUNTAIN of EMPIRICAL evidence gathered from many different experiments and from many different countries…ALL confirming and Strengthening the arguments for a world response to the VERY REAL THREATS of Man MADE Global Warming. The nonsense about greenhouses having very high CO2 levels is totally irrelevant….Greenhouses have sophisticated ventilation systems to cut heat buildup so as to NOT KILL OFF their vegitation. SADLY, we do not have such a system for the entire planet. For thousands of years since the last ice age, CO2/Methane/Water Vapor have been in a VERY delicate balance…meteorites, vulcanoes etc. all taken into that balance….CO2 was at about 280-300PPM and humans on earth grew and prospered. ***In the late 1700’s through today, humans have been digging up Carbon Based fuel and burning it….We have driven up CO2 & other greenhouse gases….YES, the comprise a tiny fraction our atmosphere….but the rest of our atmosphere is invisible to incoming SOLAR RADIATION….CO2 & Methane have staying power in the atmosphere and ABSORB the energy from solar radiation & reflect that energy into our atmosphere….raising temperatures….temperatures around the world are rising in the atmosphere, temps. are rising in ALL of the oceans…and yes, temps are rising in the soil. Now lets talk about this “good for plants”….yes, millions of years ago, ((no humans on earth)) with occasional higher CO2, there was a vast burst of plant life…plants that were not edible by humans today….Strong evidence is available the shows high CO2 levels actually depletes nutrients from food….recently research, published in peer reviewed scientific journals reveals a great reduction in ZINC in staple food grains which the world is dependent upon…30% of the world already suffers with zinc deficiency which leads to disease. the comparable readings from TREE RINGS and we arrive at the same conclusion…..we are hotter in the last 20 years than in thousands of year. The last 10 years were even hotter. Last year was the hottest year…..
DO WE SEE A PATTERN…. ….Coincidentally, CO2 & Methane today are at higher levels that at any time in over 600,000 years. GREENHOUSE Gases manufactured by humans are warming the earth. 1. is raising sea levels simply by warming water. 2. is melting ice sheets & glaciers (Montana’s glacier national park had 150 pristine glaciers a few decades ago, today ONLY 25 REMAIN ! 3. TRILLIONS of dollars of InfraStructure lies within 3 feet or less of sea levels: ports & port cities, naval bases, prime farm land, highways and energy hubs….and millions and millions of people. 4. Hurricane Sandy, which wasn’t even a hurricane when it hit, propelled a risen sea with tidal storm surge and caused BILLIONS OF DOLLARS of damage, much of which has not been repaired, years later. 5. DC & NY have tidal flooding. 7. Miami has committed millions to buying huge pumps to protect the city from tidal flooding. 8. Cities around the world are experiencing the same…and as every decade passes and seas rise even more, dozens of cities will be added to the list. 9. Millions of people live in that same 3 feet or less from sea level. 10.14 of the 15 hottest record years have occurred in the last 15 years…..despite the propaganda about a “pause” manufactured by right/industry spokesmen. PermaFrost (permanent frost in the ground) is melting from Alaska, across Canada and Russia through Siberia….ROADS, Houses, Power lines are all crumbling as the FROZEN FOUNDATION that has been built upon for centuries, is melting.. The research and warning started in earnest in 1859…. The Scientific Community en mass put a detailed alarming report on the desk of the President in 1965! Warning about all of these threats. normal – the highest since area-averaged statistics began in 1946. River basin did not reach half of the summer average, causing severe drought. changing climate, Mr. Jarraud continued. ROFLOL. Your post is Gish Gallop. QUEST, an Emmy Award-winning multimedia science series, has a new focus on the science of sustainability.The half-hour magazine style episodes are produced by a collaboration of six public broadcasters around the country and explore a wide variety of sustainability issues related to food, energy, water, climate and biodiversity. The story segments featured in each show are introduced by on-camera host, environmental journalist Simran Sethi. The series also includes half-hour specials that focus on a single topic. All 2013-2014 television programs can be viewed online in their entirety or as individual segments by clicking on the titles and images listed below. The programs are also broadcast in each of our six PBS partner regions including North Carolina, Ohio, Nebraska, Northern California and the Pacific Northwest. Check local listings for broadcast dates and times. Prev What Are Greenhouse Gases and Where Do They Come From? Next What Is Climate Change?